Today's Gospel (cf. Mk 6: 7-13) narrates the moment in which Jesus sends the Twelve on a mission. After having called them by name one by one, "because they were with him" (Mk 3:14), listening to his words and observing his gestures of healing, now he calls them again to "send them two by two" (6, 7) in the villages where He was going to go. It is a sort of "training" of what will be called to do after the Resurrection of the Lord with the power of the Holy Spirit. The Gospel passage focuses on the style of the missionary, which we can summarize in two points: the mission has a center; the mission has a face. The missionary disciple has first of all a center of reference, which is the person of Jesus. The story indicates it using a series of verbs that have him by subject - "called to himself", "he took to send them", "gave them power "," he commanded, "" he told them "(verses 7.8.10) - so that the going and working of the Twelve appears as the radiating from a center, the repetition of the presence and work of Jesus in the their missionary action. This shows how the Apostles have nothing to announce, nor their ability to demonstrate, but speak and act as "sent", as messengers of Jesus. This Gospel episode also concerns us, and not only the priests, but all the baptized, called to witness in the various environments of life, the Gospel of Christ. And even for us this mission is authentic only starting from its changeless center which is Jesus. It is not an initiative of individual believers, groups or even large groups, but it is the Church's mission inseparably united with her Lord. No Christian proclaims the Gospel "on his own", but only sent by the Church who received the mandate from Christ himself. It is precisely Baptism that makes us missionaries. A baptized who does not feel the need to proclaim the Gospel, to announce Jesus, is not a good Christian. The second characteristic of the style of the missionary is, so to speak, a face, which consists in the poverty of the means. His equipment meets a criterion of sobriety. The Twelve, in fact, have the order "to take nothing but a stick for the journey: neither bread nor bag, nor money in the belt" (v. 8). The Master wants them free and light, without support and without favors, sure only of the love of Him that sends them, strong only of his word that they go to announce. The staff and the sandals are the endowments of the pilgrims, because they are the messengers of the kingdom of God, not omnipotent managers, not immovable officials, not on tour. Let's think, for example, of this Diocese of which I am the Bishop. Let's think of some saints of this diocese of Rome: San Filippo Neri, San Benedetto Giuseppe Labre, Sant'Alessio, Santa Ludovica Albertini, Santa Francesca Romana, San Gaspare Del Bufalo and many others. They were not officials or businessmen, but humble Kingdom workers. They had this face. And to this "face" also belongs the way in which the message is received: in fact it may happen that it is not welcomed or listened to (see verse 11). This too is poverty: the experience of failure. The story of Jesus, who was rejected and crucified, prefigures the destiny of his messenger. And only if we are united with him, dead and risen, can we find the courage of evangelization. May the Virgin Mary, the first disciple and missionary of the Word of God, help us to bring the message of the Gospel to the world in a humble and radiant exultation, beyond any rejection, misunderstanding or tribulation. I warmly greet all of you, Romans and pilgrims from Italy and from various parts of the world: families, parish groups, associations. In particular, I greet the Sisters of the Precious Blood of Monza, the novices of the Daughters of Mary Help of Christians from different countries and the young Poles of the Diocese of Pelplin (Poland), who take part in a course of spiritual exercises in Assisi. I wish everyone a happy Sunday and, please, do not forget to pray for me. Good lunch and goodbye! (What is the Angelus? The Angelus is a special prayer recited by Catholics three times a day, at 6am, noon, and 6pm and is accompanied by the ringing of the Angelus bell. The name comes from the Latin word for Angel and the prayer itself reminds us of how Jesus Christ assumed our human nature through the Mystery of the Incarnation. 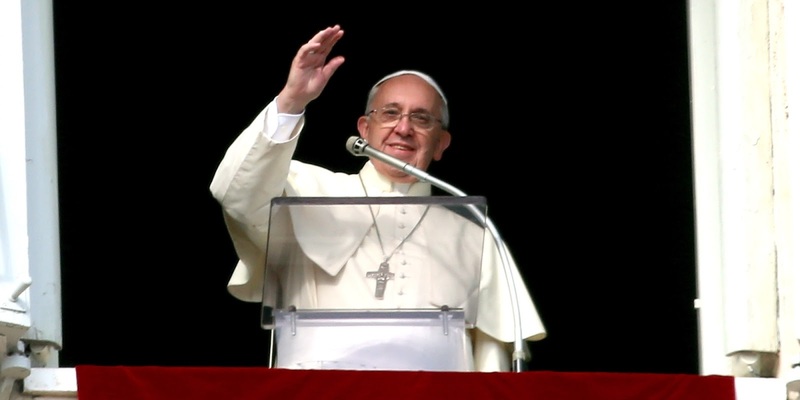 The Pope recites the Angelus prayer in St Peter’s Square every Sunday at midday.